Be A HERO partnered with Smile Africa to raise the shipping costs ($8,000.00) to provide 10 school libraries for 10 communities in Ghana. Over 40,000 books, 50 computers, library supplies, barrels of dehydrated soup mix, and some medical items were shipped to Ghana in a 40’ container. Smile Africa International is a non-profit organization registered in Canada that helps children and youth realize their potential to improve their place in society. With the central goal of advancing literacy, Smile Africa seeks to give learners the means to both increase their knowledge base and make the marketplace – social, economic and political life – more accessible to those with weak literacy skills. Smile Africa believes that empowering Africa to overcome its poverty begins with educating children. Chris J. Ellom, president, started developing the vision for SMILE AFRICA in 1992 during a visit to his homeland in Ghana. He became aware of the dehumanizing poverty that existed in rural communities and it impacted him deeply. The overcoming realization was the lack of opportunity for children to learn and develop their potential. Chris, together with his wife Kathleen, decided to take action and SMILE AFRICA INTERNATIONAL was born. Since then, the organization has been helping hundreds of children in Africa develop a passion for reading and learning about the world and their future. Literacy education offers them the tools they need to expand their minds and hopefully transform their circumstances. There have been over 80,000 books donated, and school libraries, computer and language labs and leadership programs have been established to accomplish their vision – and they have the passion and objective to establish hundreds more. The vision of SMILE AFRICA remains one of shared responsibilities and equal opportunity for people to participate in their own development. In a world, in which every society is striving to reach for the stars, there is danger that many in Africa will not see the light unless groups like this work strenuously to increase the quality of human learning via projects like these. Be A Hero partnered with Smile Africa and donated enough to allow Smile Africa to ship over 40,000 books and other resources to support our work in Ghana last year. Be A HERO has partnered with Smile Africa and raised the shipping costs ($8,000.00) to provide 10 school libraries for 10 communities in Ghana. Over 40,000 books, 50 computers, library supplies, supplies, and some medical items have been shipped to Ghana in a 40’ container. 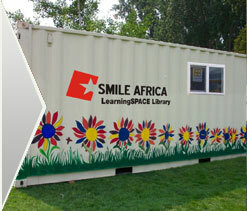 The container has been retrofitted to become a library at Be A HERO/Hope for the Nation’s Agape Children’s Home in Accra, Ghana. Once emptied of goods, the container now houses books and resource materials. Computers have been set up for the use of the students, and the community. The balance of the books, computers and supplies have been distributed to 9 other schools in Ghana. Pass the Book: Small library management and lending skills for teachers and volunteers. Thanks to everyone who donated towards this project.